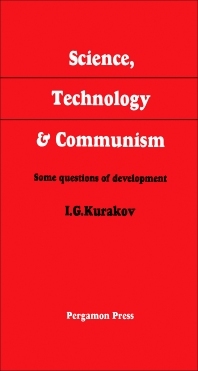 Science, Technology, and Communism: Some Questions of Development focuses on the relationship of science, technology, and communism, including indicator of incentives, formation of funds, technological processes, and production processes. The book first offers information on science as a direct productive force in society and material incentives for the development of science and technology. Discussions focus on basic indicator of incentives, formation of funds for the development of science and technology and material incentives, and system of collective and individual material incentives. The text then elaborates on the general tasks in the development of science and technology, including the development and improvement of existing technological processes, automation and mechanization of production processes, and improvement of methods for planning national economic development. The publication ponders on directions in the development of science and technology and planning the development of science and technology. Topics include mechanical energy, chemical products, distribution of productive forces in an economic district, choice of scientific and scientific-technical tasks to be included in plans for the development of science and technology, and perspective planning of the development of science and technology. The book is a vital source of data for readers interested in the relationship of science, technology, and communism.